With his father's rodeo legacy to continue and a prosperous spread to run, Walker Parrish has no time to dwell on wrecked relationships. But country-western sweetheart Casey Elder is out of the spotlight and back in Parable, Montana. And Walker can't ignore that his "act now, think later" passion for Casey has had consequences. Two teenage consequences! Keeping her children's paternity under wraps has always been part of Casey's plan to give them normal, uncomplicated lives. Now the best way to hold her family together seems to be to let Walker be a part of it-as her husband of convenience. Or will some secrets-like Casey's desire to be the rancher's wife in every way-unravel, with unforeseen results? The premise is on the unrealistic side--two times they were intimate, two times they took the normal precautions and two times it failed and kids were the result. Walker was in the kids' lives as a family friend but now that they are living in the neighborhood he wants more--he wants to be a dad and a husband. I liked the story. 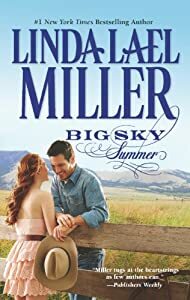 Linda Lael Miller tells a face-paced fun romantic story even if it doesn't make sense and honestly, other than the fact that they were both nice people, I don't see what these two saw in each other. Even they say they get along better in the bedroom than out--and yes, we are in the bedroom with them. I look forward to seeing Walker's sister married off in a future book. When does "no" really mean "yes", or put another way, do actions speak louder than words? If I tell a guy I don't want to be intimate with him, is it ok for him to physically try to change my mind, not by attacking me and overpowering me with superior strength but rather by seducing me? Does the fact that I put myself in a situation in which intimacy is likely to happen make any difference? At one point in this book Casey says she doesn't want to be intimate with Walker. At that point they were sleeping together. He managed to change her mind. He never forced himself on her, but by starting things (and she didn't protest) he went against her previously stated desires.